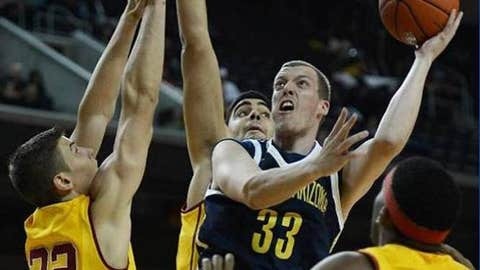 NAU's Max Jacobsen had 13 points and the go-ahead basket in the final minute in Saturday's 63-61 win over Grand Canyon. FLAGSTAFF, Ariz. — Max Jacobsen scored 13 points, including a go-ahead bucket in the key with 18 seconds left, and Northern Arizona edged Grand Canyon 63-61 on Saturday to snap a four-game losing streak. Demetrius Walker hit two free throws with 40 seconds left to tie it at 61 before Jacobsen’s late go-ahead bucket. Grand Canyon (5-4) then had a chance to tie or win, but NAU’s Len Springs blocked the shot attempt for his fifth rejection of the game. The Lumberjacks (3-7) secured the ball and ran the clock out. Jacobsen also hit a big 3-pointer, his first of the season, to give Northern Arizona a 59-57 lead with 2:01 left. Aaseem Dixon scored 17 points and had five steals for Northern Arizona. Quinton Upshur had 14. "Coach (Jack Murphy) told us to keep our heads up and stay strong on defense so we were able to get some stops and grab some rebounds," said Dixon. Killian Larson led the Antelopes with 16 points and 11 rebounds. Walker and Jerome Garrison each scored 15, and Daniel Alexander added 14. "The crowd brought us the energy we needed," NAU junior Len Springs said. "It was great to see the fans excited. They brought us to life and helped us pull this one out."